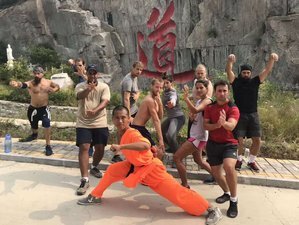 Shengjing Shan Traditional Kung Fu Academy is specialized in the teaching of traditional Chinese Kung Fu and culture to foreign students. Their dream is to reinvent the meaning of cultural exchange and education, through the daily practice of martial arts and immersing you in Chinese language, history, and culture. All of this will be done in an environment free from the stresses of daily life, in the mountains, surrounded by nature and set next to the idyllic ShengJing Shan East Flower Daoist temple. Call it what you will; a meditation retreat, Chinese language school or even fight camp, the academy can be all things to all people. The students, staff and masters all live together under the same roof. One of the buildings has up six bedrooms, a kitchen and a central dining hall where everybody enjoys their meals together. The bedrooms are particularly spacious and come with en-suite facilities. Each room has two beds as the students are required to share a room with one of their classmates. The other building is slightly larger, with a larger vegetable garden and a capacity of up to 14 students. This building was previously a hotel, and so has air conditioning available for use during the summer. Shengjing Shan wholeheartedly encourages long-term students to turn their living space into their home, whether that be putting up posters, changing the wallpaper or doing anything they think will make their room more comfortable. Master Qu also encourages his students to maintain a clean living environment as he believes that, "A clean room will lead to a clean mind", which will undoubtedly have many benefits on your training and day to day life here. There is no training during weekends, students are free to relax, train on their own at the academy or visit the local towns such as Wendeng, Weihai or even Yantai. Tai Chi Chinese martial arts can be divided rather conveniently into two categories Neijia and Waijia. This division serves only to highlight what form of training the style places particular emphasis on. The Neijia school practises the use of Neijing, otherwise known as internal strength and their practise focuses on the training of the spirit, mind, awareness, and Qi. The three main internal styles are Tai Chi, Baguazhang, and Xingyiquan. Understandably the concepts mentioned above are rather abstract and difficult to grasp, this goes for foreigners and Chinese alike. Nevertheless, the masters are well suited to guiding you along the path of self-discovery which the practise of any internal art lays before you. Unlike practising an external art, one needs to understand the moves being taught at a deeper level. It is only through the synchronisation of your own movements, feelings, breathing, and intent that mastery of a move can be achieved, hence why it is a much more subjective experience. However, despite the ambiguity that accompanies Neijia arts, our masters will provide the best possible tools to discover your own path. Despite often being considered as soft styles, some of the greatest masters in the history of China have been Neijia practitioners. When practised correctly and fully developed they become extremely powerful and effective systems, not just in the context of self-defence, but also extending to ones personal and psychological health. This sense of balance which these arts will bring, will undoubtedly lead to a greater sense of harmony and synchronicity with ones centre. Conversely, Waijia puts more emphasis on training the body itself and tends to be characterised by explosive power and rapid movements. The external styles are what is in the West often considered to be Chinese Kung Fu. It is also worth noting that the definitive number of external styles in China is almost innumerable, given that each family may have their own variation of a particular school of Kung Fu. The Waijia styles currently practised at the academy are Shaolin, Tai Chi Plum Blossom, Praying Mantis Fist, and Sanda. The students who choose to pursue one of the external styles will be pushed physically due to the rigorous conditioning and dedication demanded by these styles. That being said, these styles are accessible to anybody who arrives in good health. Chinese massage is an integral part of Traditional Chinese Medicine (TCM). Some Chinese scholars argue that a definitive massage theory had begun to circulate as early as 2700 B.C. and was used in conjunction with acupuncture to cure physical ailments. During class time, Master Qu will familiarize his students with Chinese massage theory, as well as allowing the students to explore the practical side of this healing art. Due to the nature of the training, knowledge of the body will serve to speed up your recovery process after intenese periods of training. Acupuncture is also taught here at theory level until Master Qu is satisfied with the knowledge and the commitment of the student to this class. Those who begin practicising the practical elements of acupuncture will learn basic needle insertion along the meridian lines and key acupuncture points. It is believed that Chinese cuisine is one of the most important elements of Chinese culture. Therefore, in the academy it is equally important that the students embrace this rich and unique part of Chinas heritage. The academy's cook comes from the quiet village which sits sleeply outside of the temple grounds. Using the freshest ingredients, she uses the recipes which have been passed down through her family, from generation to generation. Those students who wish to learn how to make the dishes which have characterised the Chinese countryside for hundreds of years can do so by assisting the cook in the kitchen every dinner time. The written Chinese character becomes the physical expression of how the master has focussd their mind, energised their Qi and the degree to which their energy flows onto the page. At Shengjing Shan, the classes are run by one of the temple-monks who has pledged his life to prayer and scholarly pursuits. Well versed in calligraphic theory, he was invited to the academy to guide the students and bring out each individuals own style and the best artistic expression. The system of the Dao is the essence of everything that exists in the universe and a way of living in harmony with the surrounding environment. It is the idea of accepting and yielding, seeking a balanced relationship between human beings and the natural world. Studying Daoism here is particularly advantageous as Shengjing Shan is situated on temple grounds. This is to say that you will be surrounded by an abundance of knowledge and culture, and for those interested in this field it is a cant miss opportunity to learn about Chinas most famous homegrown religion. Qi Gong is an ancient form of Chinese meditation. The characters Qi and Gong have multiple translation, nevertheless in this context they can be translated as energy work, with the implication being you are training to control your Qi. It is based on the concept of becoming aware and manipulating the Qi in your body to reach a desired effect e.g. healing an injury. Used for both medical and health purposes, it is also used by martial artists to complement their Kung Fu. Most modern Qi Gong is now a mixture between Daoist & Buddhist energy cultivation practises which combine movement with meditation. All Kung Fu makes use of energy training to develop internal force, without which it remains purely external and overly mechanical, a characteristic considered rough and inferior by high level martial artists. Kung Fu training complemented with Qi Gong enhances harmonious chi flow, thus promoting health, vitality and longevity. Those who place a large emphasis on the practise of Qi Gong will be able to build up to doing Hard Qi Gong demonstrations. Through the manipulation of the Qi in your body, the mastering of your breath and the conditioning of your body, you can expect to perform incredible feats, such as break marble with your hands or split bricks over your head. The environment at Shengjing Shan is ideal for Qi Gong. At any time you can wander into the mountain, find a quiet rock or a tranquil tree to sit by, collect your thoughts and enjoy the stillness of nature as you learn to master your Qi. The meaning of Tai Ji Quan (Tai Chi) is literally supreme, ultimate. There are a number of different styles of Tai Ji Quan practiced throughout the world today; however, the five most popular are: Chen, Yang, Wu, Sun and Wu (different). As well as being one of the most effective martial systems in all of history, it is extremely beneficial for personal health when practiced regularly. Its fundamental premise of softness means that it is extremely versatile and accessible for those of all ages and abilities. Tai Ji stresses slow, controlled breathing coupled with relaxed, balanced postures. This approach aims to eliminate unwanted tension in the practitioners body; consequently allowing the Qi to circulate freely as well as making it available to harness. The fluidity of Tai Ji permits the practitioner to meet aggressive force with softness allowing one to strike or throw using the constantly flowing energy within the body. Students will begin by learning fist forms to get a basic understanding of the system itself, from there they can then move on to more advanced things such as sword, ball and fan forms. The core elements that make up Tai Ji are fist and weapon forms, as well as qigong, which all help the student to increase overall body flexibility, body awareness and an understanding of body mechanics. Despite being somewhat underrepresented in the West, Praying Mantis is one of the most famous and revered external styles in China. The reason being its efficiency when striking, grappling, moving and defending, all conducted at extreme speed. At Shengjing Shan we place a great emphasis on ensuring good form from all of our Mantis students, as well as developing speed, power, accuracy, and mental flexibility. Furthermore the exploration of each movement you learn serves to deeper the practitioner and understanding of the art. Praying Mantis is an aesthetically unique style, founded on a devastating arsenal of techniques which can be applied in any situation. The original Praying Mantis system was first developed by Wang Lang, who originally lived in Shanxi province during the Ming Dynasty. In the later years as Praying Mantis Kung Fu continued to evolve, some characteristics of Tai Chi and Plum Blossom Fist were integrated into the style, giving rise to what we now know as Tai Chi Plum blossom Mantis. The practitioner of this style must balance the Yin and Yang in ones body, aligning their energy whilst constantly rotating the upper and lower extremities. Whilst the striking hands must move like a blooming plum blossom, cutting the opponent like the beads of the flower. The main part of Mantis development was in Shandong, hence why the province is synonymous with the art. So for those keen to master the art of self-defense, as well as begin to understand China at a deeper, provincial level we recommend you choose this style. Bagua Zhang is intrinsically linked to Daoist philosophy and is characterized by its use of a unique style of qi gong circle walking. Circle walking, coupled with the coiling and twisting movements of the style, give the skilled practitioner the ability to defend against multiple opponents with seemingly little or no effort. Bagua Zhang literally translated is 8 Trigrams Palm and is derived from the I Ching (Book of Changes) which is central to the art of Bagua Palm. Each of the 8 Trigrams represents a different kind of power in Bagua: heaven, wind, water, mountain, earth, thunder, fire, and lake. Each of these powers is characterized by that which it is named after, for example a fire technique would involve twisting, coiling, and clinging to get through the opponents defences and deliver a strike or throw. It was Dong Hai Chuan(1798-1879) who first introduced the art of Bagua Zhang to the world. Eventually his travels brought him to Beijing where he worked in the Forbidden City as a servant. Much to the delight of the emperor who was so impressed with Dong's ability he asked him for a display of his skills after which he was subsequently appointed palace bodyguard. From this time he gradually gained fame and began teaching the system to other students. Students will begin by learning the walking method and basic stances, from there they will move on to forms. Once these forms have been mastered the students can then move on to the vast array of weapons found in the Bagua system such as: Bagua broadsword, staff, single spear, double spear, straight sword, tornado broadsword, and the more exotic paired weapons such as the Bagua needles, deerhorn knives, etc. Shaolin Kung Fu is undeniably one of the most iconic and widely recognised styles of Chinese Kung Fu. It is said that the Shaolin temple was founded in 495AD, with its original purpose to serve as a Buddhist monastery. The style born out of the temple stems from humble beginnings, initially created in response to the monks' fear of bandits raiding and desecrating their holy home. Today it is an extremely diverse and multifaceted system, allowing the students of this style to pursue any number of paths which suit their individual interests. Some prefer to explore the more traditional route of practical applications and self-defense; others may choose to focus on the more aesthetic elements of Shaolin. The Shaolin masters who teach at the academy are all extremely talented and enthusiastic individuals with many accolades to their names. They are keen to share the secrets and lessons learned at the temple with foreigners, in the hope that this intrinsic element of Chinese culture continues to like live on in the hearts and minds of Chinese and non-Chinese alike. Sanda (also known as Sanshou) roughly translates as "actual combat". In the past, Chinese called it "technique fighting" or "striking". Sanda is founded on the simple concept of applying what you have learned from your traditional Kung Fu forms in the ring. It is often likened to Muay Thai, nevertheless there are some stark differences in the techniques and rules found in Chinese kickboxing. What arguably sets Sanda apart from other types of kickboxing is the wrestling element involved in the sport. Rather than opting to check or block a kick, the Sanda practitioner will see this as an opportunity to throw their opponent to the ground. Take-downs can be used at any point in the bout and are not just limited to catching kicks and sweeping legs. Depending on the nature of the competition and the rules of the regulating body, some bouts permit the use of elbows and knees, as well as the take-downs, punches and kicks that define Sanda. Although by definition Sanda is a fighting art, it has strict rules to ensure the safety of the two fighters. Rules state that attacking the back of the head, neck and crotch of the opponent is prohibited. After long-term training, having mastered even the most basic Sanda skills, a practitioner will have very fast defensive and offensive reflexes. Sanda not only improves physical qualities such as strength, endurance, flexibility, and sensitivity but also quickly develops peoples health and fitness. Master Qu began practicing Traditional Chinese Kung Fu in his childhood and it has remained his passion ever since. As headmaster of Shenjing Shan, his mission is to introduce Chinese martial arts to a wider foreign audience, to ensure its survival during these days of major industrial growth and the changing of traditions throughout China. Like many modern day masters, Master Hao perfectly blends the traditional elements of Chinese Kung Fu with contemporary sports science and nutrition. His goal as shifu at Shengjing Shan is to help reshape and reintroduce Kung Fu to the Western world, so that in the years to come it will have the same standing as Athletics, Gymnastics and Kickboxing, in both China and abroad. Shengjing Shan is located in the Wendeng prefecture of Weihai, Shandong, China. Living and training on the grounds of an ancient Daoist sanctuary, the surrounding area is rich with Chinese culture and outstanding natural beauty. Cheng Shan You: also known as China's "Cape of Good Hope", Cheng Shan You was deemed by the emperor Cin Shin Huang as the end of the sky and the final boundary of his kingdom. It is the first place in China where you can see the sun rise and illuminate the land; it truly is a mystical sight to behold. Liu Gong Island: the island home to the first Sino-Japanese War monument. Due to Weihai's geographical location and its proximity to Japan, it has always been a focal point for Sino-Japanese military tension. On the island you will be able to explore the historic relationship between these two countries, with many exhibitions being run throughout the year at the museum. Weihai International Beach: one of the most famous beaches in China, it is known known for its silky sand and gentle currents. It is the perfect place to relax your weary body after a week of training and strike up some conversation with the locals. Weihai Park: Weihai is also home to one of the biggest beach parks in China. Renowned for its combination of architecture and natural beauty, the statues, flowers and mountain rocks perfectly complement each other. The park is said to be at its most beautiful on a warm summer night. Xian Gu Ding: a magnificent and spectacularly designed temple. The most interesting attractions here are the famous inscriptions, some dating back as far as the Song dynasty. It is suggested that you fly into Beijing, Shanghai, Hong Kong or alternatively Korea and take a connecting flight to either Yantai or Weihai. Please provide us with your flight time and number so that we may pick you up. For those wishing to see more of China whilst making their way to the academy or save money on travel expenses, it is recommended that you take the train. The nearest train station is Wendeng and the staff will be more than happy to pick you up upon arrival. In order to maximize your savings, do ensure you purchase your train tickets in advance, this can be done from Ctrip website. Airport: Yantai Penglai International Airport Airport transfer available: Yantai Penglai International Airport (US$100 per person) Additional charges may apply. You can request this in the next step. Airport: Weihai Dashuibo Airport Airport transfer included: Weihai Dashuibo Airport No additional charges. You can request this in the next step. The deposit is fully refundable if the booking is cancelled up to 2 days before the arrival date. Our dream is to reinvent the meaning of cultural exchange, through the daily practice of martial arts and immersing you in Chinese culture.